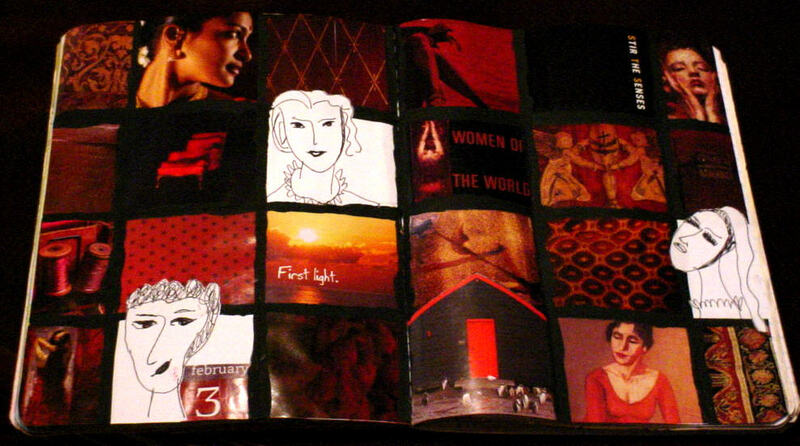 I posted a challenge to the CompositionArtJournals group on Saturday to make a grid page using this inspiration page and share it with the group. This is my grid. I started it by drawing some squares with a pen and then pulled out a couple of issues of one my favorite magazines to cut up: Veranda. Most of the images came from the two issues with a couple from a Victoria magazine and the three from an issue of Metropolitan Home that had a top 100 design issue with tons of great numbers to use. The women theme developed as I went along. I had sketched the three faces the night before and wanted to include them. At first I wasn't pleased that they weren't going to fit into the squares, but I love the way they overlap now. The color and designs started out because the one face looked medieval to me, so I picked the dark reds and the rich fabrics to match. I think it's cool that all these images and words came together from such a few magazines. This is very cool! I really like how you've carried the color throughout, and the sketches are great.